Plot: History’s most infamous sea story, focusing on the fabled mutiny by Master’s Mate Fletcher Christian and his men against their by-the-book captain, William Bligh. This is a piece of cinema that is a historical, intelligent and a film that is both unique, and brilliant in all its production. Flawless acting and superb direction, but most of all the shots of cinematography is something that has to be seen to be appreciated in all its amazing beauty. Now to be honest I had never seen this movie all the way through before. I had never watch the complete version so going into this was a new experience for me. This is based on the book Captain Bligh and Mr. Christian. So going into this film was a real treat to me, because it would be a new film experience seeing it on Blu-ray. What an extraordinary, overlooked film, and musical score. It's a true shock on just how amazing the film is. Starring Anthony Hopkins, one of the greatest actors of all time, and also alongside him, an equally brilliant actor Mel Gibson, at least in his prime. This is a beautiful woven film of high seas adventure. Amazing costumes. Amazing sets, ships. The story line itself is something that stands out, and also this is one of those films that should be spoken about, and transcend to a modern generation. This is one of those films that at first, sadly for some reason, has been overlooked and never given a Blu-ray until now. Thankfully Twilight Time has honored this film with an amazing transfer, a wonderful isolated music track and some amazing special features. Twilight time tends to always shock me on the quality they give certain films that seem to be overlooked. As I have stated, going into this, I had never really seen it and I have to be honest, never even read up on it, or researched it. I went into this kind of a blank slate other than remember certain shots of the film. The film blew me away at the quality, the story, the acting, and most of all the amazing direction. I'm so happy that Twilight Time has honored this film and given it the respect that it deserves. This is a must see, must own, extraordinary production of a forgotten film and a new outlet, that is equally artistic in color and in sound. This has a stellar cast and one of the few films I've seen with such extraordinary performers all in one film. From one of my favorite modern day actors, Daniel Day Lewis to the master of cinema Laurence Olivier. It is unbelievable at the class and quality inside each performer’s character. The characterizations on film, takes you and places you inside the time. This is a wonderful drama. It's a wonderful historical drama. Now the movie itself had its problems coming to light. The original director David Lean dropped out during the film which halted the picture in limbo, but to save the film, and all the money that had been put into the picture, Roger Donaldson was brought in to finish the movie. I think something that stands out is Oliver Reed was also sought for the part that eventually went to Anthony Hopkins. Reed would have been a fantastic actor for the part, but Anthony was the part, and created the character in perfection. The amazing ship, The Bounty that was built for the movie is extraordinary to look at. It’s beautiful and is a wonder artistic craftsmanship. The ship is so beautiful and vibrant, and detailed, and now it is a Tourist destination in Hong Kong China. A work of art and a historical style ship that made the film so much more powerful in its tale of Mutiny. Also what makes this film stand out is the utterly fantastic art of cinematographer done by a legend and master of the lens, Arthur Ibbetson. What he did for, The Bounty is beyond words in description. It has to be seen to fully understand and fathom the art of cinematographer that this film details. Ibbetson has done some of the great, artistic and visionary style films that lent true creativity and eye opening images to the history of film making. He has done such greats as, Willy Wonka and the Chocolate Factory, Santa Claus: The Movie, Whistle Down the Wind and many others. He had a total ownership of his craft and he did it with ease, and a fantastic eye. On an interesting note there has been many different versions of this story on film. One of those the 1916 silent film, The Mutiny of the Bounty, and also the 1933, In the Wake of the Bounty, starring the very beautiful and handsome ladies’ man, and man’s, man, Errol Flynn. Now it would ultimately be the 1935 version, starring the one and only actor and ultimate master of performing, Clark Gable in, Mutiny on the Bounty that most remember and talk about. Gable was truly fantastic in this part. This film would be remade in 1962 starring the one and only, Godfather himself, Marlon Brando alongside the terrific Richard Harris. Now there is a discussion on just which one is the more of the story. Simply put, more accurate in a historical setting. I think all the versions are great and each one, has their own quality to them through amazing acting, sets, and even personalization of the character that the actors are playing. I have to choose this version, that I am reviewing as being the historical setup, and ultimately the depiction of just what the story is, and the truths, historically, in the situation taking place. 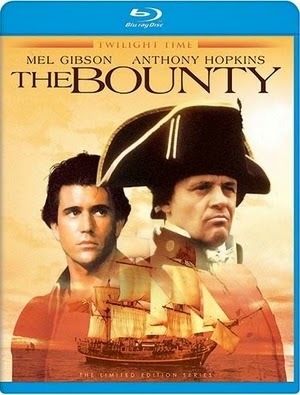 The Bounty is a film that any lover of history, sea fare, will absolutely fall head over in love with. Its high quality of acting, direction and most of all, the special effects, and the realism of the sets that come off to the viewer. Everything that went into creating something that seems real and is happening before your eyes, is breathless. The direction by Roger Donaldson is mind numbing entertainment and something that should be spoken about for its beauty and its completion. Donaldson has a mastery in capturing a story that comes together as believable and tense. The Bounty is to me, is one of his prime achievements in film making. I have always loved his style of films, from the amazing suspense thriller, No Way Out, to the action destruction film, Dante’s Peak and all the way to his Sci-fi Drive-in style Species. Now Donaldson was not the first director on The Bounty, as I have stated, and that is where some of the struggle of the film comes in. Originally behind the direction, was the master of the lens, Sir David Lean. Lean is most famous for directing many powerful epic films, such as, The Bridge on the River Kwai. The masterpiece, Lawrence of Arabia, and the equally masterpiece, Doctor Zhivago. But, and that is a huge but, it would be to me, two of his films that define his excellence, and that would be the adaptions of Charles Dickens works, 1946's Great Expectations and 1948’s Oliver Twist. Both are pivotal pieces of cinema that should be seen. Sadly Lean wanted to create a huge epic to The Bounty, Creating it, in two separate films, and then at one time wanted to make it into a 7 part TV miniseries. He got the backing through the money by the wonderful Italian master himself Dino De Laurentiis. The production went ahead, and the cost of the ship which came in at 4 million dollars, pushed the film to be made, but during the script writing, sadly Robert Bolt had a stroke and could not finish. Melvyn Bragg took over writing. Whatever happened, Lean was forced out of the project, or abandoned it, because of different ideas and beliefs. Whatever the case was, the movie did go forward and ended up becoming a wonderful historical drama, and epic style film at sea. Twilight Time did a fantastic job of bringing this film to Blu-ray. This was pure unbelievable ear and eye perfection. The video is so beautiful, vibrant, and the sound is like what it would be like hearing for the first time; the amazement of it. Twilight Time did such a fantastic job on this release. Every time I watch a Twilight Time Blu-ray, in many of the moments, I think to myself, this is their best, but now I say it again on another one. This is their best sound quality and video I have seen. I went ahead and sought out The Bounty on DVD through a local video shop, yes they still exist in certain spots, and rented The Bounty. Boy what a difference in quality. The DVD simple put is poop, compared to this Twilight Time Blu-ray. I mean poop is not a professional word in any form or fashion, but that’s the best way to describe the difference, DVD big pile of poop and Twilight Time Blu-ray Golden. I suppose if the DVD is all we had, then it would have to do, but the Blu-ray is the better, and is something to showcase, what can be done to an old and forgotten about film. Perfection in audio and video. Now the music itself is something to talk about and mention. I could probably write four pages just on it, but I will save you from having to read my spew. I will shorten it. The master. There is no other word that should be said to describe this man, other than master. Evangelos Odysseas Papathanassiou, or simply known as Vangelis. He is the very definition of music and soundtracks and composer. He has worked on and created some of the greatest tunes to ever grace cinema. He is a multi-talented musician, from composer, to piano, electronic, progressive rock, classical, new age and everything else. Not only mastering this, Bounty soundtrack, which is lovingly given an extra feature of the isolated music. Twilight Time knows the importance of music, and in most cases for their Blu-ray's they give an extra feature of the isolated music. He has worked some of the great films, Chariots of Fire, Blade Runner, and many more. He also did the one and only, amazing TV series, by master genius, Carl Sagan, COSMOS: A Personal Journey. Vangelis is someone that is so unique, you can’t understand until you hear his work. He is one more added beauty to this film. The extra isolated music track is to me the best Twilight Time has done. It is utterly phenomenal and something that to me is required listening. This Blu-ray is worth the buy just for this. Audio Commentaries: Director Roger Donaldson, Producer Bernard Williams and Production Designer John Graysmark. This was a very informative and unique commentary that stands out and should be listened to, to fully understand and appreciate the value of this film to cinema history. You also get the commentary with history consultant Stephen Walters. He explains the history and the reality of the subject, and its real life truths, the history of HMS Bounty. This should be listened to by any history buff or historical movie lover. And as always and equally important is the insert booklet by film historian Julie Kirgo, which is always a perfect treat to read. This is a Blu-ray of top notch quality, and a brilliant example of a product that stands out and should be experienced. Thoroughly entertained by the film and the music, but most of all knowing everything that went into this film to be made, is extraordinary. Twilight Time Blu-ray honored this amazing film with an outlet of perfection. A powerful product of just how to treat a film that has often been overlooked. A must own Blu-ray in my viewpoint so make sure you head over and purchase this Limited Edition, 3,000 Unit Blu-ray before they all go.